There are a couple of very dark non-detective novels of post-unification Germany: Rain, by Karen Duve, published in 1999 and in English translation by Anthea Bell in 2002, is a gloomy, grotesque tale of a loser who agrees to ghost-write a gangster's memoir, and takes his beautiful wife to a cabin in the former East, where he can live cheaply while working on the book. Rain, damp, and ensuing slugs (lots and lots of them) and other horrors intervene in his plans, resulting in a grotesque, skin-crawling allegory of postmodern life in general and German life in particular, post reunification. The tale is gross, comic, disgusting, and fascinating. One of the German reviewers invoked Elmore Leonard to describe the deadpan dialogue, and the U.K. publisher (Bloomsbury) invoked Carl Hiassen to describe the comedy, but Duve's comedy goes beyond both of those estimable models with muck, slugs, a central character as slimy as the slugs, a dangerous case of writers' block, an impatient gangster, and a pair of odd avenging spinsters. So far as I can tell, Duve has only one other translated novel, This is Not a Love Story, which sounds like a creepy black comedy about an overweight heroine, and unapproachable love interest, and an infamous England-Germany World Cup match. 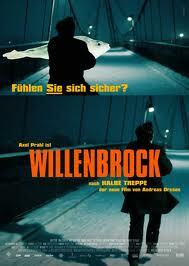 A less compelling but more pleasant dark comedy can be found in Christoph Hein's Willenbrock, which deals with crime and ultimately murder, but in a flat, laconic style more geared toward a literary audience than a genre crowd. 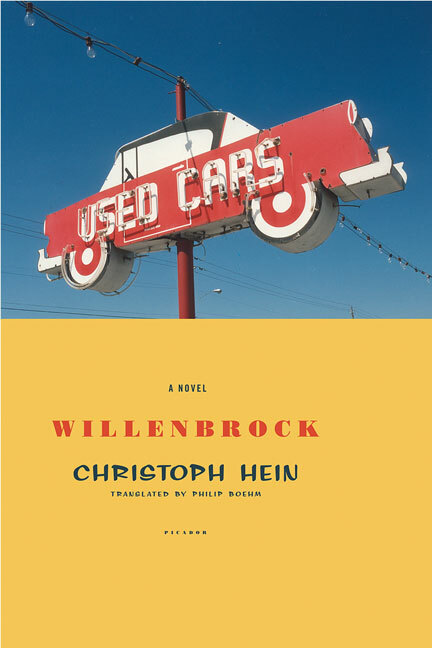 Willenbrock is a former Easterner making a go of it as a used car entrepreneur in the new Germany, but confronted by social ills and tensions that are both new and age-old among the Germans. Most of the novel and most of the comedy is in the mirroring of everyday life in the used car business, which is also the source of the threat and the crime. Willenbrock might be a good way to ease your way back into normality after the excesses and grotesqueries of Rain: but it's probably Rain that will stick in your mind (whether for its pleasures or its disgusting bits). Of the covers I've pasted in here, the two on Willenbrock show the cinematic and the quotidian aspects, and the two on Rain suggest the disgusting bits. All are effective. There is something about German crime fiction - Ingrid Noll, Andrea Maria Schenkel, Petra Himmesfahr, Sebastian Junger, Julie Zeh......what is the defining factor? There is something similar about all of them, though they are all rather different books the Zeitgeist seems to be common. From your post, the same might be applied to these earlier novels - at least the ones by Duve? I think you're right about the Zeitgeist of German crime fiction: with the notable exceptions of Jakob Arjouni and Pieke Bierman, the German crime novels that have been translated have not been detective stories or procedurals. They're about the crime, not the solving of the crime. More psychological thrillers than mysteries, maybe. Though we know the German public loves mysteries (the biggest fans of Donna Leon are in Germany, where they were turned into a TV series). Maybe the German detectives just don't get translated? This post is just one reason why I really love visiting your blog. Just like this post, I always find a very informative post in your blog every time I visit it. I did not mean Junger, sorry (he's the Perfect Storm man), I meant Fitzbeck (Therapy). Interesting points, Glenn, thanks. I have an Arjouni on my shelf so will "promote" it up the reading order. Noir Nation, a new international e-journal of crime/noir fiction in English, is looking for submissions from writers in Europe. For more information see Noir Nation on Facebook, or our promotional video http://www.youtube.com/watch?v=I0MlSe6zU-k, or http://www.kickstarter.com/projects/1925429247/noir-nation-international-journal-of-crime-fiction?ref=live or contact the editor Alan Thomas at alan@noirnation.com. Noir Nation pays a flat fee per piece and rights revert to the author. Looking for short stories, graphic novels, and short films, in English. We are particularly looking for work with a 21st Century feel.